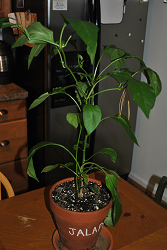 I had one last plant holding on as the weather has cooled, a Jalapeno plant. I brought it inside but it needs more light. I’ve been looking at indoor grow lights, the T5 fluorescent or the new LEDs? I can’t even eat the jalapenos that the plant produces, but I would still like to see if I can keep it alive long enough, to at least take some cuttings from it. Indoor lighting has changed quite a bit, and the types of indoor grow lights have changed along with the new trends in LEDs. I was working up in Beltsville, Maryland when I noticed a hydroponics store. It’s not very often you see a store dedicated to hydroponics, I had to stop and check it out. I had a very “enlightening” conversation with one of the store hydroponic and indoor lighting guru named Nigel. Nigel showed me some of the latest setups for growing indoors, it was fascinating how many different types of buckets with pumps, grow tents, lighting and fertilizers they have. I will do a follow up article on one of their indoor growing setups in the future, but back to lighting. Nigel told me that the T5 has been used for quite a while and is very economical, but the new style, multi colored LEDs last longer and are much cheaper to operate. And unfortunately cost more to buy. In doing some research to try and decide which route to go, this is what I have found so far. One thing to consider with T5 is the versatility to be able to use the bulb in standard fluorescent fixtures, along with fluorescent bulbs used for ordinary lighting. This can help save some cost in getting started with indoor grow lights. The T5 nomenclature refers to the diameter of the bulb, being 5/8”, and they come in standard 2’ & 4’ lengths. The T5 provides the type of light that is needed for your plant to grow, they produce 100 lumens per watt, last a long time and is not expensive to operate, unlike the halide lighting systems. Let’s compare then LED. 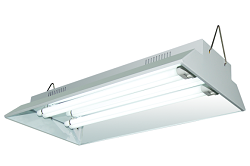 The T5 lights are rated for a lifespan of roughly 20,000 hours and they retain their power with little degradation. LED grow lights have and average lifespan of 50,000 to 100,000 hours. T5 grow lights produce very little heat so they can be placed close to the plants, about 2-6 inches. The LED produces hardly any heat and can be placed almost touching the plants, plus their light intensity is much greater than the fluorescent lights. If you have an investment in T5 lighting or the older T8 or T12 lighting systems, you might want to consider an upgrade. The T5 lighting tubes can be changed out for LED lighting tubes of the same diameter, and easily fit in the same lighting system. Another consideration, if you are really concerned about the environment, which you should be, then LED is the way to go, hands down. They are completely recyclable and do not contain harmful chemicals or gasses. If you have a lot of indoor plants, or hydroponic systems, you will not go wrong with LED. If you want to keep a few plants going or maybe start a new crop of herbs in you Aquaponics system, as is the case with me, then it really boils down to how much you want to invest. Admin, By. 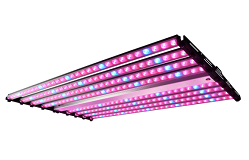 “T5 Grow Lights vs LED Grow Lights, Which Is Right One for You.” Cob LED Grow Light. N.p., 26 May 2016. Web. 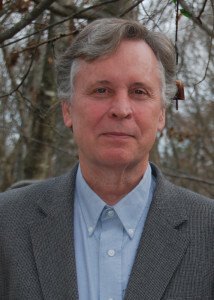 15 Nov. 2016.